1. 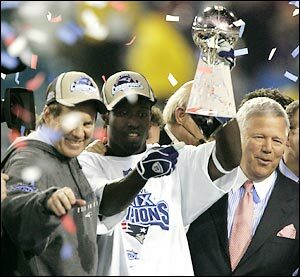 Deion Branch has reached an agreement to come back to the Patriots. Most saw t his coming from a mile away. And now with Hernandez going down, we needed someone else who was familiar with our system. As a former Super Bowl MVP and one of Tom Brady’s favorite players to be around, this is a big move for the Pats that all fans should love. Branch had 702 yards last season and 5 Touchdowns. New England left his locker exactly the same as when he left, something they failed to do with the hopeful return of Brian Waters. 2. Kellen Winslow reached a deal with the Pats to help immediately in place or Hernandez. Winslow has caught for more than 1100 yards in a season with the Browns, and 4 other 700+ yard seasons with the Bucaneers/Browns. 3. The Pats released WR Greg Salas to make room for Branch on the roster. He played for McDaniels at St. Louis last season and quickly became one of there most reliable players. He has been hurt for a while but the Pats will not rule out bringing him back later in the season to keep him around our system. He is only 24 years old out of Hawaii and had 264 yards in only 6 games last season but he averaged 9.8 yards per catch. This entry was posted in Patriots and tagged afc east, boston sports blog, branch, bsb, football, nfl, patriots, pats, salas, wide receiver, winsolow by christoph131. Bookmark the permalink.